Tweet I have never been a big fan of spiders. I wouldn't say that I was ever arachnophobic, especially since I can quite happily catch an errant eight-legged visitor to my flat using a glass and a coaster, before depositing them safely outside, but I just don't really like them. 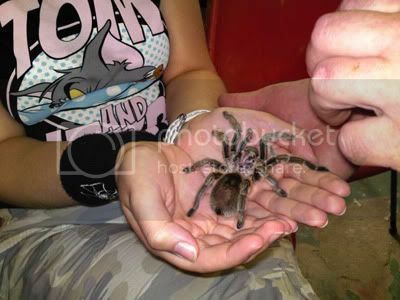 So it was with a mixture of dismay and fascination that I met a Chilean Rose spider at an animal handling session at Wingham Wildlife Park in Kent on Monday. The handler started us off with a pair of cute baby lemurs, before progressing to a young raccoon, then a baby alligator, and finally a royal python, before bringing out the finale. At first, I decided not to handle her (she's called Rosie). However, I remembered that I have a reputation as being fearless to defend, and so thrust my phone at my mother with the instructions to take a photo, before sticking out my hands. I can honestly say it was bizarre, but not a bad experience. She was so light that I could barely feel her sitting on my palm, and the fact that she was furry simply let me look at her as a fuzzy creature instead of a spider. I don't think I'll ever actually like spiders but now I think I'm a lot less worried by them.